25 June 2018 – The National Health Service is turning 70 on 5th July 2018. It’s the perfect opportunity to celebrate the achievements of one of the nation’s most loved institutions, to appreciate the vital role the service plays in our lives, and to recognise and thank the extraordinary NHS staff – the everyday heroes – who are there to guide, support and care for us, day in, day out. This year is the perfect opportunity to celebrate the achievements of one of the nation’s most loved institutions, and more particularly, what we have achieved, those who have learnt and worked here, and those we have cared for at the three hospitals in Leicester. Nationally, over the last 70 years, the NHS has transformed the health and well being of the nation, providing free high quality health care for all which has subsequently made it the envy of the world. 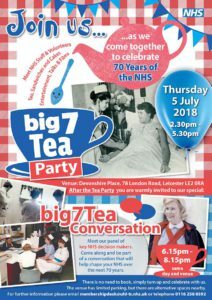 In Leicester we are holding our Big 7-Tea Party on 5th July at Devonshire Place and an event for families we’re working on with the University of Leicester – a Teddy Bear’s Picnic. See our poster. The University of Leicester and the local NHS Trusts it works with every day would like to invite the Leicester community to attend a FREE Family Day at the University’s main campus. We would like to raise awareness about the NHS and its wonderful gift to us, and encourage our children – the next generation – to value our healthcare system and support the NHS as it goes forward. Children and their favorite stuffed animals are invited to join us for a Teddy Bear Clinic, a fun event that helps educate children about what happens at the doctor’s office. Each child’s stuffed animal is checked-in, then children take their animals in to meet with a medical student doctor for a check-up. Medical students will also be running mini-health checks for the teddies owners and their parents. Are you a Leicester Baby we’re looking for your baby photos. NHS70: Share your stories! To mark the 70th anniversary of the NHS, we are asking you all to share your stories with the Hospitals! The Leicestershire Partnership Trust will talk about child health and safety, as well as do paediatric first aid demonstrations and give talks on nutrition. University Hospitals Leicester will demonstrate the fun in science, and have clinicians and experts from Paediatrics and the Children’s Hospital. Arts and crafts from the Creation Station – worry dolls, play d’oh healthy pizza, pasta skeletons, foot and hand-print fruit and vegetable characters. Leicester University Community First Responders will be there giving defibrillator training. Outreach activities like ‘Brain Hats’ and ‘Heart Pumps’. Free parking will be available in the Welford Road car-park. Entry is free, but we will ask visitors to donate whatever they like towards the Children’s Hospital appeal. 11 June 2018 – The National Health Service is turning 70 on 5th July 2018. It’s the perfect opportunity to celebrate the achievements of one of the nation’s most loved institutions, to appreciate the vital role the service plays in our lives, and to recognise and thank the extraordinary NHS staff – the everyday heroes – who are there to guide, support and care for us, day in, day out. This year is the perfect opportunity to celebrate the achievements of one of the nation’s most loved institutions, and more particularly, what we have achieved, those who have learnt and worked here, and those we have cared for at the three hospitals in Leicester. Nationally, over the last 70 years, the NHS has transformed the health and well being of the nation, providing free high quality health care for all which has subsequently made it the envy of the world. 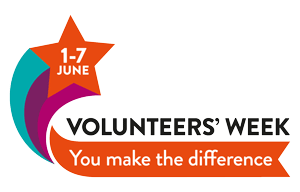 It’s Volunteers Week – 1st to 7th June 2018. 2 June 2018 – Volunteers’ Week is a chance to be part of the UK’s biggest celebration of volunteering, recognising the contribution of 23 million people who volunteer in their communities across the UK. Volunteers’ Week is a long-standing, popular event in the voluntary sector, established in 1984. It is supported and celebrated by small grassroots organisations as well as larger, household-name charities, who together run hundreds of events across the UK. These events showcase and celebrate volunteers and the contribution volunteering makes in our communities. University Hospitals of Leicester are celebrating Volunteers Week 2018 between 1-7 June and asking staff & patients alike to say thanks to our volunteers for all they do. The week culminates with the Volunteer Thank You Event for all UHL volunteers. Every member of Radio Fox is a volunteer who donates their time, talent and expertise for free to run Radio Fox for the benefit of patients and staff of the Leicester Royal Infirmary and The Glenfield Hospital. 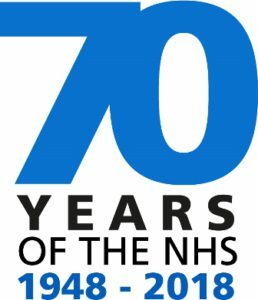 21 May 2018 – The National Health Service is turning 70 on 5th July 2018. It’s the perfect opportunity to celebrate the achievements of one of the nation’s most loved institutions, to appreciate the vital role the service plays in our lives, and to recognise and thank the extraordinary NHS staff – the everyday heroes – who are there to guide, support and care for us, day in, day out. This year is the perfect opportunity to celebrate the achievements of one of the nation’s most loved institutions, and more particularly, what we have achieved, those who have learnt and worked here, and those we have cared for at the three hospitals in Leicester. Nationally, over the last 70 years, the NHS has transformed the health and well being of the nation, providing free high quality health care for all which has subsequently made it the envy of the world. In Leicester we are holding our Big 7-Tea Party on 5th July at Devonshire Place and an event for families we’re working on with the University of Leicester – a Teddy Bear’s Picnic. 04 May 2018 – Radio Fox supports Dystonia Awareness week 2018 from 5th to the 13th May. Dystonia, estimated to affect at least 70,000 people in the UK across all generations from childhood upwards, is a very painful, debilitating and disabling disorder, however it lacks awareness among the general public and medical professionals. Dystonia Awareness Week is all about raising awareness of dystonia and there are many ways to get involved. The Dystonia Society was established in 1983 by a small group of people affected by dystonia, with the support of the late Professor David Marsden. The Society was established to promote the welfare of people who are affected by any form of the neurological movement disorder known as dystonia. The Society aims to do this by promoting awareness of the disorder, by supporting research and by undertaking welfare initiatives. It does this on a national level and through its network of local support groups. 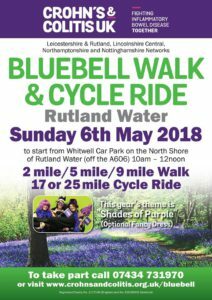 03 May 2018 – On Sunday 6th May the Bluebell Walk and Cycle Ride at Rutland Water returns for 2018. Everyone is welcome to come and join us. We have challenges suitable for all abilities from short walks to a lengthy cycle ride!. Join the hundreds this year at Rutland Water for the annual Bluebell Walk & Cycle Ride to help raise awareness of Crohn’s & Colitis UK. Choose a 2 or 5 mile walk or a 17 or 25 mile cycle ride around Rutland Water, starting at the Whitwell Car Park on the North Shore, postcode LE15 8BL. Radio Fox will be there to see you set off anywhere between 10am to 12 noon. Challenge yourself, friends or just bring the family along for a great time through the tree-lined and bluebell paths of Rutland Water. Find some sponsors for your effort, bring a picnic or use the cafes on site. If you wish don’t forget to take part in the optional fancy dress theme. This year’s theme is ‘Shades Of Purple’. Or of course you could just come and enjoy a walk through the bluebells and listen to the music of Radio Fox. Or even have a nice cup of tea at The Crafty Fox cafe. Coming soon to a hospital near you. The Radio Fox 30th Birthday Party. 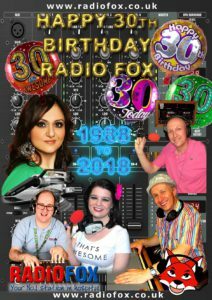 11 Apr 2018 – On 23rd April 2018 Radio Fox will be 30 years old. We’re not looking bad for our age and we’re still as trendy as ever. Somehow the registered charity Radio Fox has survived 30 years without any official funding. Recently after 2 years of fundraising by our members we are currently refurbishing our main studio and we want to celebrate our 30th birthday. On Sunday 22nd April there will be a whole day of 30th birthday broadcasting, from 8am until after midnight see our Birthday Schedule. Over all those years since Radio Fox began many many volunteer presenters have visited and entertained the patients of the Leicester Royal Infirmary and The Glenfield Hospital, and we still do today. Leave the snow outside and get yourself all warm and toasty inside by listening to Radio Fox. Now available on the UKonlineRadio portal as well as Tunein. 1 Feb 2018 – From today the live output of Radio Fox can be heard in the Leicester Royal Infirmary LEat Street Restaurant. You can also hear Radio Fox at the LEat Street Restaurant at the Glenfield Hospital. The LEat Street Restaurant is open to patients, visitors and staff and is located on the ground floor of the Balmoral Building. The opening times are Monday to Friday – 7:30am until 2:30pm and Saturday, Sunday & Bank Holidays – 7.00am – 7.00pm. Also in the restaurant area is the Soho Coffee Bar with opening times of Monday to Friday – 7:00am until 7:00pm. 26 Jan 2018 – Blood Bikes offer a free courier service for hospitals and associated health organisations in Leicestershire and Rutland carrying blood stocks, blood products, pathology samples and scans, in fact any medical essentials that need to be moved. In addition we support the Leicestershire Air Ambulance with blood products and the Midlands Milk Bank with the transportation of donated breast milk for premature babies. Listen Again to Jonathan Bostock from Blood Bikes on the Radio Fox 628 Show as he explains to presenters Marie Smith and Michael Lord all about the service Blood Bikes provide hospitals. 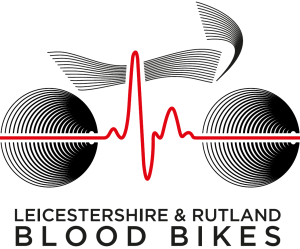 Leicestershire and Rutland Blood Bikes is a registered charity, run 100% by volunteers and their running costs are met through the incredible support and donations from individual supporters, local businesses and the general public. They have a fleet of three liveried motorcycles and currently two vans, for when loads exceed the capacity of the motorcycles, as well as during extreme weather, such as snow and ice! Their riders all hold an advanced qualification, such as Institute of Advanced Motorcyclists, RoSPA, Enhanced Rider Scheme, or Police Class 1. Primarily, but not exclusively, they deliver their service ‘out of hours’, so at night time during weekdays with a 24 hour service at weekends and public holidays. Their objective is simple – to support local NHS and associated organisations with the provision of free transport of medical essentials in support of patient care. Through this we they help the NHS to reduce transport costs, so that more money can be directed at front line patient services and care. Blood Bikes are always looking for additional volunteers who can help the group, by giving some of their spare time to help us meet our objectives. Many volunteers are motorcyclists but this is not a necessity. There is no minimum commitment level, so whether you have a few hours or a few days each month, there is something for you to help with. The three main roles are, riders, controllers and fundraisers and if you have an interest in joining us, or you would like to make a donation, please visit our website at www.lrbloodbikes.org.uk or email us at enquiries@lrbloodbikes.org.uk and we will be very happy to answer your questions, or invite you along to an event or supporters evening. You can also follow us on Facebook and Twitter.